Bardo Pond - "Cypher Documents I"
Essentially a collection of tracks otherwise available only on the Bardo Pond website as MP3 files, Cypher Documents I is the first installment in a series that will collect studio recordings released in a variety of media, including singles and compilations. Though known primarily for their extended, fuzzed-out psyche jams, Cypher Documents I features only one track (the 31-minute "From the Sky") that replicates the "conventional" Bardo Pond sound. The other tracks are generally shorter, tighter and less free form, but of course all the Pond trademarks are there: the monolithic approach to mixing, unintelligible vocals, relentlessly grinding guitars, and the overload rumble of bass. It's always been the kind of sound that, if you're not careful, will put you through some altered states. There are times of course when the sheer sonic bulk of a Bardo Pond disc is simply too overwhelming - sort of like experiencing metal fatigue in an isolation tank, but then such excesses can be both a vice and a virtue. The aforementioned "From the Sky" unquestionably drives home the point. Like an arctic glacier, it slowly builds layer upon layer of crushing solidity until the entire piece becomes encased in its own crystallized mass. "Slag" is aptly titled, a droning metalized work song that comes across as an anthem for robots mining the heavy metals of some far distant planet's iron core. "Nomad" interrupts the psychosonic onslaught at least temporarily. Slowly evolving out of a primordial bass riff, "Nomad" is about as close Bardo Pond ever comes to relaxing the full frontal assault on your senses, and in the process almost sounds like a track that could've been on Soon Over Babaluma or another post-Damo Suzuki Can album. "Quiet Tristin" continues the brief excursion into deep ambience, though with somewhat of a more deliberately muted, almost haunting, atmosphere. But "YaYaYaYa" and "Black Turban" takes us back to the anarchic frenzy we've all come to expect from the Pond-and with a vengeance, too. 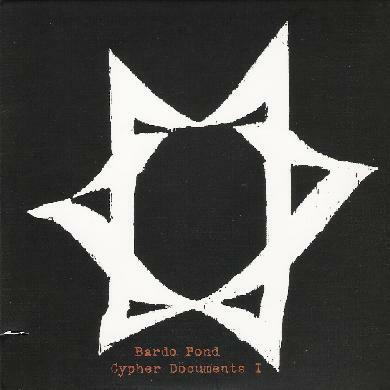 Cypher Documents I is essential listening for the true blue Bardo Pond faithful. Others, however, who are unacquainted with the group, will undoubtedly want to begin with the Pond's definitive document, Set and Setting, and then work their way up to the Cypher Documents series. For more information you can visit the Bardo Pond web site at: http://www.bardopond.org. Visit the Three Lobed web site at: http://www.threelobed.com.